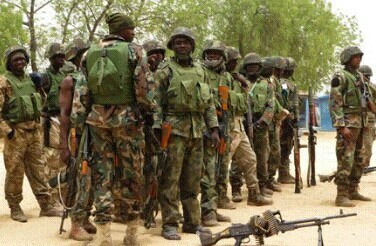 The Army said yesterday that it has extended Exercise Ayem Akpatuma (Cat Race) in Taraba State by two months. A statement by the Army Director of Public Relations, Brig.-Gen. Texas Chukwu, said: “The exercise needs to be sustained in some areas in other to consolidate on the initial gains. “Exercise Ayem Akpatuma was launched on February 20 to train troops in North Central and parts of North West on planning and conduct of ‘Military Operations Other Than War’. “The exercise was also aimed at further sustaining the Army’s constitutional roles of defending Nigeria’s territorial integrity and aiding the civil authority to maintain peace and security. Exercise Ayem Akpatuma has recorded tremendous successes despite challenges. “However, the exercise needs to be sustained in some areas in other to consolidate on the initial gains. In view of the development, the exercise has been extended for two months in Taraba State. “The extension becomes necessary to further consolidate on the gains achieved so far, and due to calls by well-meaning Nigerians. The extension will facilitate the Army’s efforts of ridding the affected areas of militants and other criminal elements.